Sitting on a sixteen point lead from last nights leg, curtailed after 12 races following injuries to Ben Barker and Jack Parkinson Blackburn which made the 'Bears' even weaker, it was a concern when half the lead disappeared in the first three races! Michael Palm Toft trapped ahead in heat 1 with Todd and Nathan Greaves passing and re-passing for second place. Nathan made a lurid dive on the third lap and clattered into Todd who is lucky to stay on. Kyle is unable to make any headway as he gets filled in every time he moves off the inside. It's the same story in heat 2 as it seems the track has been over watered. Jan jumps the start in heat 3 but Darren had already stopped the race by the time Jan had looped it and landed on his arse. Jonas and Matej trapped in the restart and Lasse was unable to use his knowledge of the track to make any headway. With half our lead gone in three races there were some anxious faces among the traveling support. Charles rounds the field to lead out of turn two in heat 4 and James pushes Jordan but can't prize him away from the white line. Matej off gate 4 in heat 5 runs out of room on the first bend and bales out into the fence. He suggests his bike is stuck and the race is stopped, but the track staff haven't read his book of cheats and pick it up immediately. Darren has seen it all before and not only discludes Matej, but he also gives his partner Jonas a 15m handicap for not clearing the track! Kyle and Todd are untroubled in the rerun and take the opportunity to try some wider lines, especially on the second turn where they splatter the Tigers on tour with great splats of soggy shale! But the 'Bears' lead is down to just 2 points and all is not lost. Nathan off gate three is taken down by Jack who was off gate 4 and is discluded. Charles lead the rerun and Michael passes Nathan but the heat is shared. Lasse leads heat 7 and Jan passes Jordan on the back straight to go second. Lasse then pulls a locker at the top of the third and fourth bends and Jan all but lays it down to avoid him. Lasse recovers fast enough to regain the lead but Jan is left half a lap down on the rest of the field. He gets his head down and closes in on Rob Shuttleworth and dives under him out of turn 2 on the last lap. Todd traps and wins heat 8. Jonas traps ahead in heat 9 but Charles knows his way around the Media Prima Arena and takes the lead out of turn 2 on the third lap. Jack Smith keeps the pressure on and is rewarded as he passes Matej on the inside of the last turn. Lasse and Jan trap ahead in heat 10 and Michael and Jordan are content to race each other. Tigers are now 6 points ahead on the night, and 22 ahead on aggregate. Kyle leads by the back straight in heat 11 and never looks like being caught. Nathan traps to lead heat 12 but Jan dives under him out of turn four on the first lap. Jonas then hunts him down and takes second on the last lap. Charles traps and is joined at the front by Kyle with Michael in close attendance in heat 13. Michael tries an outside blast at the end of the third lap but doesn't quite pull it off. He tries the same on the last lap and Kyle goes wide to try and deny him but Michael squeezes past regardless. The Bears need two 5-1's to force a draw on the night. Heat 14 sees Lasse make the gate. James goes up the banking to pass Nathan on the last bend of the second lap and then goes around Jason on the third turn lap three for a glorious 5-1. Jan's efforts are rewarded by a nomination for heat 15 but Michael wins from Charles and Jonas. After a very shaky start the Tigers fortunes changed with the track conditions. 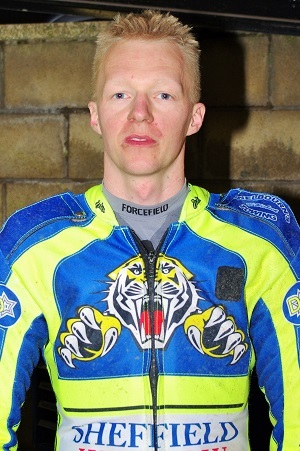 The Bears were suffering from injuries before losing another two riders last night so cannot be criticized for losing the tie, but the Tigers should be applauded for the size of the victory.